I've discovered this dress while browsing LaRedoute.fr to see if I can find some more bargains. The brand was not specified, and it was ridiculous cheap, but I liked the colorful embroideries, so I bought it. To my surprise, when I received the package, I discovered it was actually Paul&Joe Sister, a brand I really like because of their funny clothes and accessories. 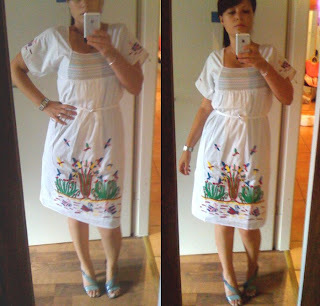 The reactions were mixed: some called it a peasant traditional dress, others asked me if I bought it while in Mexico. What do you think?